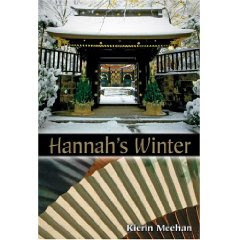 Hannah's Winter by Kierin Meehan. Kane/Miller. 2009. Originally published in Australia. Review copy supplied by publisher. Middle Grade. The Plot: Hannah, 12, is staying with friends of her mother in Kanazawa, Japan. It's supposed to be an opportunity for Hannah to polish her Japanese language skills. Instead, it turns into an adventure to help a ghost. The Good: Japan and Hannah's Japanese family are never portrayed as the "exotic other." Hannah's parents, and Hannah, had lived in Japan when Hannah was a toddler; Hannah continued studying Japanese back home in Australia. Her mother, a horticulturist and writer, is visiting Japan to write about gardens so believes this is the perfect opportunity for Hannah to improve her Japanese skills. Meehan studied and taught Japanese and lived in Japan; her love and respect for Japan, it's culture, history, and language shines through. When Hannah is at a local festival, her reaction is open, enthusiastic: "wonderful smells wafted past." Not exotic, not different, not strange -- just, simply, wonderful. Meehan also avoids stereotypes in describing the physical appearance of the family Hannah will be staying with. Miki, the 13 year old girl, "had an oval face and a long nose and her grandmother's wicked black eyes." As for Aunt Yukiyo, "[t]he first thing that struck me [about Aunt Yukiyo] was that she looked like a movie star. Her face was perfectly symmetrical, pale skin, jet-black hair. People who look like Snow White and not like a garden gnome are so lucky." (Hannah thinks of herself as a garden gnome). Meehan's description of people captures personality in a handful of words; here is Hannah, talking about her mother: "But if it's logical my mother won't do it. She's opposed to logic and common sense. If there were street marches protesting against logic, she'd be at the front of the crowd carrying the biggest banner." Hannah and Miki find a mysterious verse in a box of old toys and soon after, a ghost starts to haunt the family. This is a great middle grade story; Hannah and Miki are 12 and 13, so at just the right age for younger kids who want to read up. The story is mysterious and also logical; and the girls (along with a neighborhood boy) have to take action, decode things, figure it out. There is some help from the grown ups; but there is just enough autonomy. Having finished this, I really want to visit Japan and especially Kanazawa. Books are going to make me go broke; not from buying them, but from all the places I want to visit (and food I want to eat) after reading them. There are some delicious doughnuts described in this book. Yum. This sounds really interesting, and I'll have to see if I can track down a copy. Mr Lush and I went to Japan in February, although not to Kanazawa, and we want to go back again some day soon. This looks like such an interesting story. I'd love to travel to Japan one day, too. Kierin is a wonderful writer—I'm a great fan of her lovely, literary novels for smart young readers. She's only published a handful, and is not one of our "big" names here—although she's won some significant State literary awards. I'm glad she's being appreciated across the very large pond! This looks fabulous. I shall definitely add this to my list. I just finished this, thanks to your recommendation, and Loved it. Now I want to go to Japan too.